Storm Damage or Insurance Questions? With exceptional services and quality customer care, our roofing repair and installation experts service the cities of St. Cloud, Sauk Rapids, Sartell, Waite Park, St. Joseph & other surrounding cities. We are confident we can exceed your expectations, for a free estimate on your roofing repairs, installation or maintenance, give Exterior Pro a call at 844-275-4776. With exceptional services and quality customer care, our roofing repair and installation experts service the cities of Alexandira, Little Falls, Peirz, Sauk Centre, Osakis & other surrounding cities. We are confident we can exceed your expectations, for a free estimate on your roofing repairs, installation or maintenance, give Exterior Pro a call at 844-275-4776. 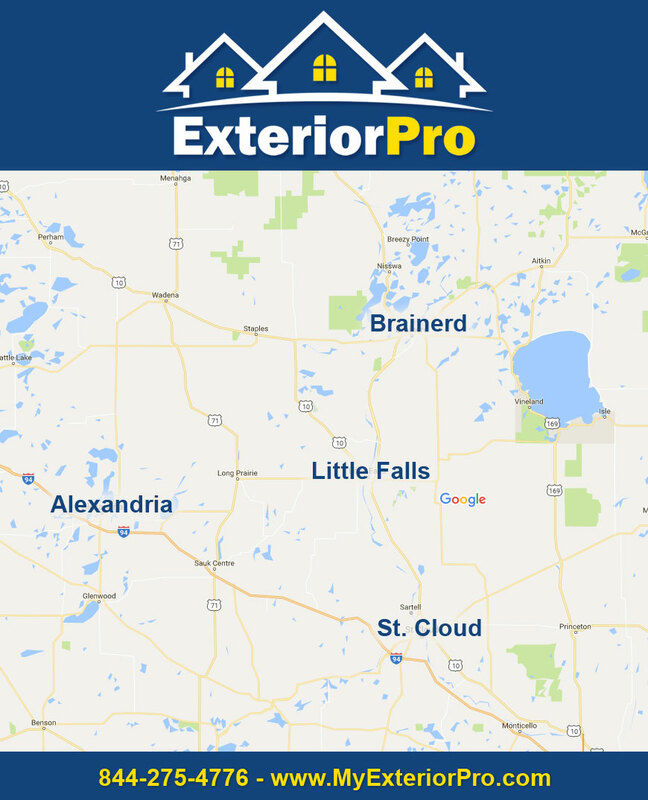 With exceptional services and quality customer care, our roofing repair and installation experts service the cities of Brainerd, Baxter, Nisswa, Crosslake, Breezy Point, Pequot Lakes, Pine River, Motley, Staples & other surrounding cities. We are confident we can exceed your expectations, for a free estimate on your roofing repairs, installation or maintenance, give Exterior Pro a call at 844-275-4776. My Exterior Pro © 2019.